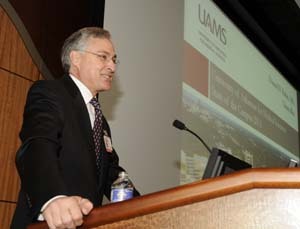 “Another key issue for us, I believe is diversity… UAMS’ progress is inextricably tied to diversity. I really believe that. The tapestry of our collective background enriches all that we do and it strengthens who we are. We live in an increasingly pluralistic society. Our campus community will be enriched if it reflects the diversity of the society that we are here to serve. I hope that we will be able to redouble our efforts and make concrete progress toward a more inclusive, culturally competent, and diverse campus community. This is complex. It is complex. And it doesn’t imply that we do not all hold inclusiveness as a goal. But we’ve got to develop the organizational strategies that enable us to make demonstrable progress. The Center for Diversity Affairs and campus committees and task forces will lead our efforts, but it really is everyone’s job. And we must have everyone involved. To see more, watch the can watch the full State of the Campus address online.